The Honduran Congress has voted to allow troops to take on police duties as the country confronts the world's highest murder rate. The measure means soldiers will be authorised to conduct arrests and searches. Troops were deployed to patrol the streets last month after two murders in which policemen were implicated. 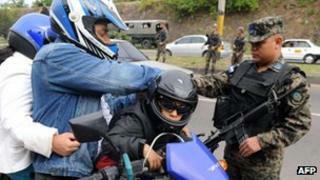 Honduras is following the example of Mexico where troops have been used to take on drug gangs since December 2006. Members of the Honduran Congress voted to allow a reform of the constitution to allow the armed forces to be used for police duties "in emergency situations which affect people and goods". In addition, soldiers may be used "on a permanent basis in the fight against drug-trafficking and terrorism, weapons-trafficking and organised crime". According to the UN Office on Drugs and Crime, Honduras has the world's highest homicide rate - 82.1 murders per 100,000 inhabitants. There are on average 20 killings a day, the majority blamed on drug and street gangs. "This legislation will allow the armed forces to take on policing roles to confront organised crime and drug-traffickers operating across the country," Oswaldo Ramos from the governing conservative party said. However, some members of Congress voiced concern. "We have serious doubts about the implications of sending the army to do police work," Sergio Castellanos was quoted as saying by Reuters news agency. "They are not prepared to deal with civilians and this will only strengthen their position in society after the coup", he said, referring to the military's role in removing President Manuel Zelaya from office in 2009. But given the documented cases of violence and corruption within the Honduran police force, opinion polls suggest people feel safer with soldiers on patrol. In October, the government launched Operation Lightning, deploying troops alongside police in areas dominated by criminal gangs. This was in response to a wave of violence, including the high-profile killing of two students, with police officers accused of involvement.